The Great Basin Indian Archives @ VHC is a collaborative digital exhibition of Western Shoshone oral histories, language and cultural resources to help revitalize the Western Shoshoni language and preserve the living culture. GBC Talks: “Defining Native Americans: The Blood Quantum Issue” discusses what and how “Blood Quantum” is defined, which is a very popular yet highly controversial topic amongst Native Americans. The three panelists each discuss significant factors that impact how blood quantums have transformed over time and now influence membership policies for tribes. Panelists include Dr. Scott A. Gavorsky (History Professor, Great Basin College), Jens Camp (Research Associate, Great Basin Institute and California Trail Interpretative Center), and James Hedrick (Cultural Manager, Newe Ghani Cultural Center). The Great Basin Indian Archives (GBIA) director Norm Cavanaugh recently discussed how the Shoshone Community Language Initiative (SCLI) is helping revitalize the Western Shoshoni language on KNPR's "State of Nevada" radio program. Joining Norm was the VHC's Scott Gavorsky to discuss the GBIA Elder Oral History Project. In addition to students from Western Shoshone communities of Nevada and Idaho, SCLI 2017 welcomed students from New Jersey, Oregon, and California. 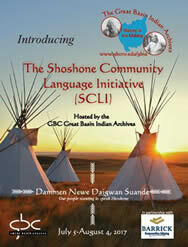 Video courtesy of the the University of Utah Shoshoni Language Project. Any views, findings, conclusions, or recommendations expressed do not necessarily represent those of the National Endowment for the Humanities, Barrick Gold North America, or Great Basin College.